The SKB Gig Bags feature a ballistic nylon construction with heavy-duty dual zips and a fully lined interior ensuring your drum is always protected when youre on the road going from gig to gig. 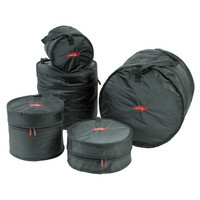 This gig bag set is made up of five bags providing the ability to accommodate toms floor toms a snare and bass drum. All SKB gig bags include ergonomic handles with double stitched straps delivering durability and making these bags ideal for any travelling drummer. This entry was posted in SKB and tagged Drums-and-Percussion. Bookmark the permalink.